Thomas Hobbes was the first great English political philosopher. His work excited intense controversy among his contemporaries and continues to do so in our own time. In this masterly introduction to his work, Bernard Gert provides the first account of Hobbes’s political and moral philosophy that makes it clear why he is regarded as one of the best philosophers of all time in both of these fields. In a succinct and engaging analysis the book illustrates that the commonly accepted view of Hobbes as holding psychological egoism is not only incompatible with his account of human nature but is also incompatible with the moral and political theories that he puts forward. It also explains why Hobbes’s contemporaries did not accept his explicit claim to be providing a natural law account of morality. Gert shows that for Hobbes, civil society is established by a free-gift of their right of nature by the citizens; it does not involve a mutual contract between citizens and sovereign. As injustice involves breaking a contract, the sovereign cannot be unjust; however, the sovereign can be guilty of ingratitude, which is immoral. This distinction between injustice and immorality is part of a sophisticated and nuanced political theory that is in stark contrast to the reading often incorrectly attributed to Hobbes that “might makes right”. It illustrates how Hobbes’s goal of avoiding civil war provides the key to understanding his moral and political philosophy. Hobbes: Prince of Peace is likely to become the classic introduction to the work of Thomas Hobbes and will be a valuable resource for scholars and students seeking to understand the importance and relevance of his work today. Bernard Gert is Stone Professor of Intellectual and Moral Philosophy at Dartmouth College. Chapter 1: Hobbes's Life, Times, and General Philosophical Views. Chapter 3: Hobbes's Moral Theory. Chapter 4: Hobbes's Political Theory. "The present reviewer is very enthusiastic about this book. It should be recommended to all those that are looking for an understandable and thorough introduction to the moral and political theories of Hobbes." "A sympathetic reading that will be valuable for those interested in Hobbes' enduring philosophical relevance." "Gert succeeds in clarifying the important parts of Hobbes' philosophy ... Experts will welcome this book as a collection of ideas from an influential authority on Hobbes." "Bernard Gert's book provides beginning students with an outstanding introduction to the main philosophical concepts and interpretive debates needed for understanding Hobbes's philosophy. Gert puts Hobbes's works into historical context, plausibly explains his motives, and offers a critical yet constructive account of his moral and political philosophies. Gert's is a model of clarity and thoughtful scholarship." "Bernard Gert has here produced the new standard interpretation of Hobbes's philosophy. The writing throughout is completely accessible to readers working even at the most elementary level of philosophy, ethics, or political science. Nonetheless, philosophers will like it for its precision and careful analyses of controversial topics; non-philosophers for its clarity and its ability to supplement the original without loss of content. This is THE book on Hobbes for the coming generation." 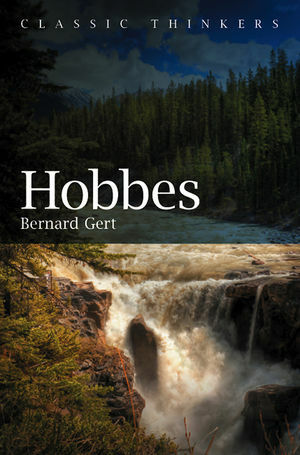 "Hobbes: Prince of Peace, by Bernard Gert, is the long-awaited product of his 45 years of immersion in the Hobbes corpus. In it, Gert he weaves together the many threads of Hobbes's theory into a single comprehensive account. Showing that readers shouldn't always take what Hobbes writes completely literally, Gert argues for an innovative reading of Hobbes's view on the interrelation between key concepts, such as reason, the laws of nature, and the moral law, and for recognizing distinctions that have heretofore been overlooked. This provocative book will surely be an important touchstone for Hobbes scholarship in the future."